The new school year got off to a slow yet chaotic start. I hid in the eye of the storm while my colleagues meandered about like flustered shopkeepers. Each year, the school schedule takes about two weeks to fully organize and understand. Everybody has new students, new classes and new time schedules. This year we also had new English textbooks. My main task was to write a Small Project Assistance (SPA) grant for my school and local community. In contrast to a Peace Corps Partnership Program Grant (PCPP), a SPA grant is co-sponsored by the US Peace Corps and USAID for community development and civic engagement projects among Peace Corps Volunteers. Last semester, I planned to write a PCPP grant with my school in order to buy new textbooks for the 400 Specialized English language students at my school. This grant is not sponsored by the government but rather partners my Ukrainian school with personal friends, family and organizations back in the USA. It is then my prerogative to raise 80% of the money we need amongst them. I had two main reasons why I did not do this and chose to write a SPA grant instead. (1) It was a lot of money to raise and I HATE fundraising. (2) Unknown to me last semester, some classes had already collected money to buy new textbooks the following year. This told me there was no longer a need for my help but merely a desire. Our finalized SPA grant requests funding for two main elements (1) two professional development seminars for teachers and students of my school as well as Romny community members (2) initial start up costs for a project resource center. The first seminar will introduce the basics of project planning, explain how to incorporate academic projects within the classroom and how to teach students to do their own independent projects. The second seminar will introduce the concept of fundraising as well as its legal limitations in Ukraine. Learning how to effectively fundraise will give my community the tools to help themselves by providing sustainable financial support for the resource center in the future. Our grant has now been submitted to a to a PC grant committee who will review, edit and approve or reject it for funding. I am also a member of this committee, but of course, will be out of the room when they review mine. 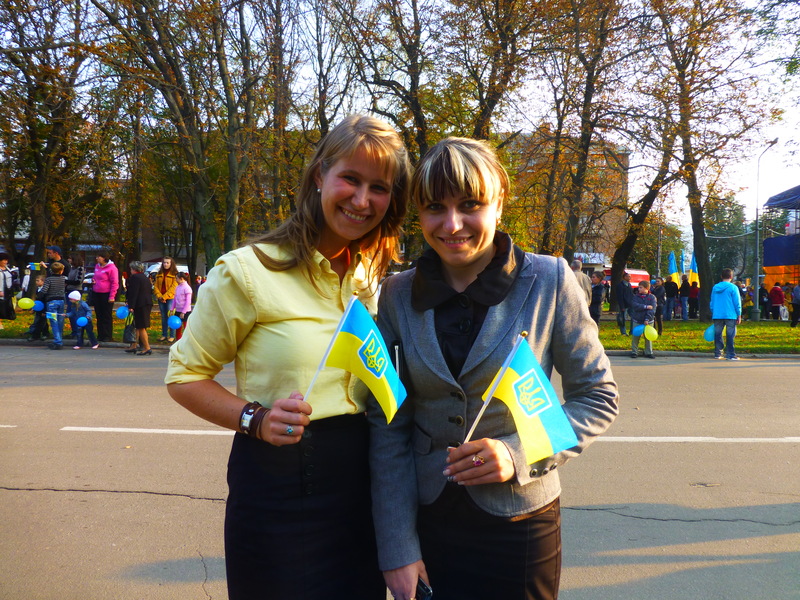 However, I will participate in the approval process for the other 50 that were submitted by volunteers in Ukraine. 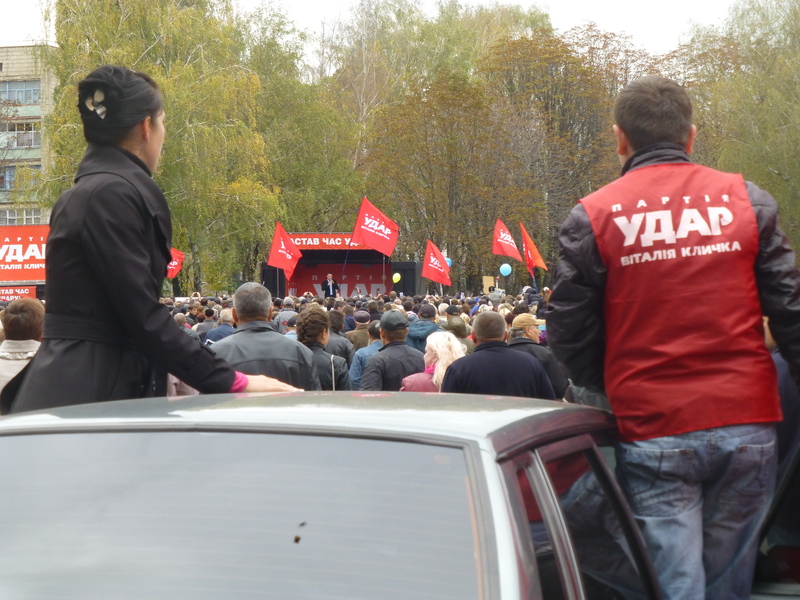 About thirty PCVs traveled to Kiev to participate in the half Marathon. 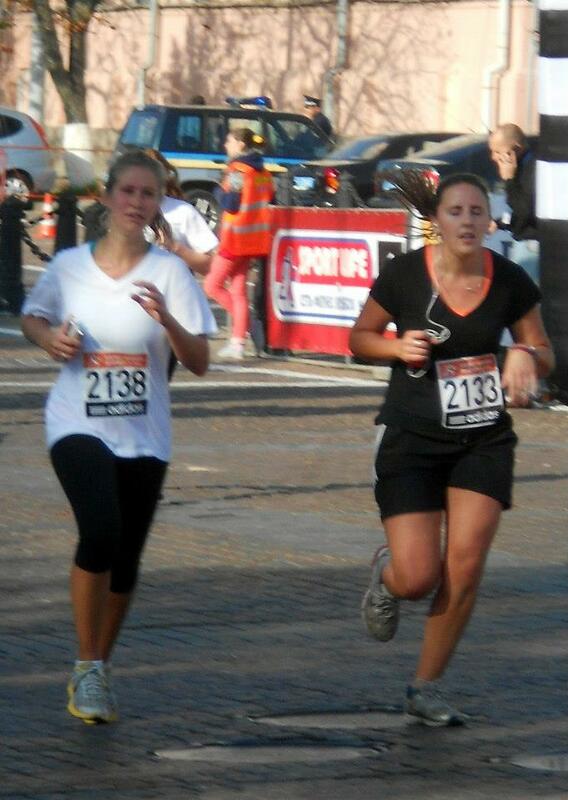 I ran in the 5-kilometer race and survived. I’ve fallen in love with the European Union volunteers who work at the Center for European Initiative in Sumy. They organize and host many English language Camps conspicuously named, SMART camps. I participated in one with the theme of diversity taught a lesson on Stereotypes. There, I had the opportunity to meet and work with three amazing volunteers from Slovenia, Norway and France. 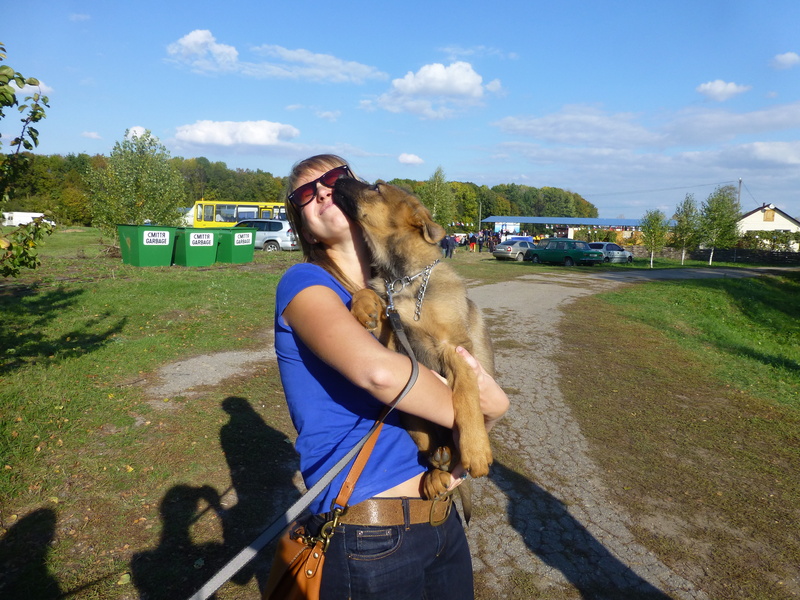 A nearby village named Gai, was selected to host the 2012 World Championship of Rescue Dogs. 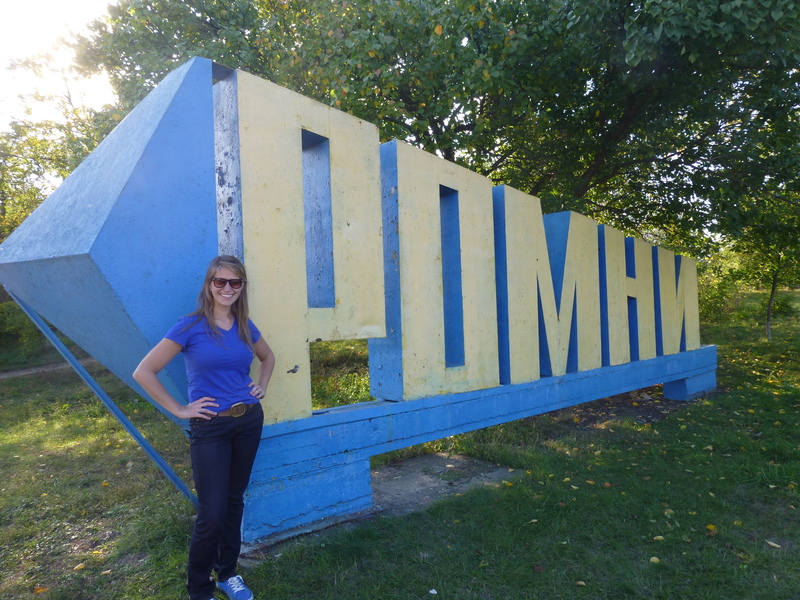 Since Romny is the closest city, we hosted the opening ceremony. There were competitors from 14 different countries around the world. 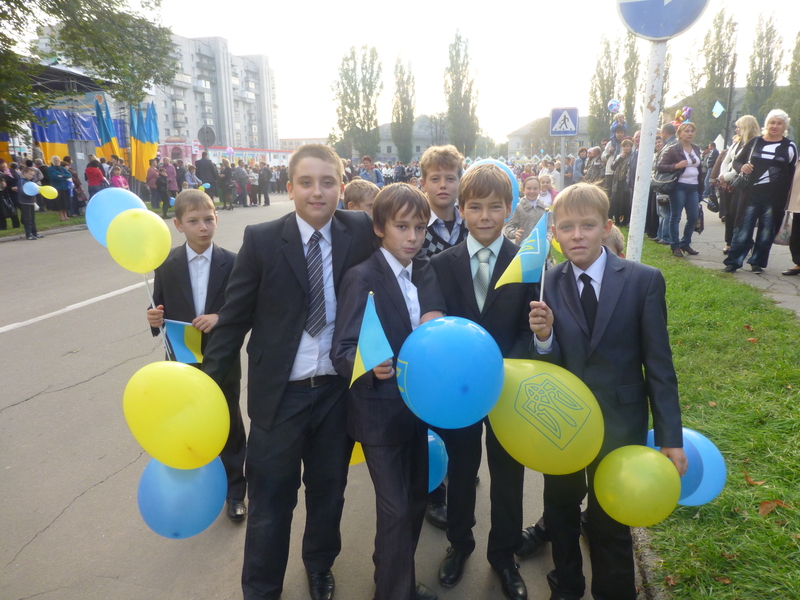 My school was chosen to welcome them and represent Ukraine at the parade by lining the streets with yellow/blue balloons and cheering as they marched down to the center square. A huge disco party followed the opening ceremony. There were fog machines, laser lights, flashing images projected on buildings and about 1000 people gathered for the celebration. 5th Form boys in their suits! Can you get any cuter? Since one of our English teachers competed in the national ‘Best English Teacher of the Year’ contest and won on an Oblast level, we were asked to host an Oblast wide English seminar. This involved presenting model lessons, hosting discussion sessions and providing entertainment for about 30 teachers from around the Oblast. I co-taught a model lesson with Lesia for about ten teachers while two of our other most experienced teachers modeled for the other 20 guests. Then we all watched a master lesson from Tanya, the contest winner. Each lesson was concluded with a round of commentary, questions and answers. Providing entertainment caused the most stress among my colleagues, but they did an incredible job. All ten of them worked together to write a script for an hour-long play about a University professor who takes his students on a trip in his Time Machine through Great Britain. This however, was only a subplot in the more broad story line of our students starting a ‘World Map Project’ in our school English Club hosted by yours truly. Great Britain was chosen as our first country to explore. Our best and brightest students were chosen for parts in this play. There were songs, poems, and comic relief. Everything was memorized and presented with the traditional Ukrainian smile. The final product was beautiful, effective and loved by our audience. I visited Gai to see the rescue dog competitions. 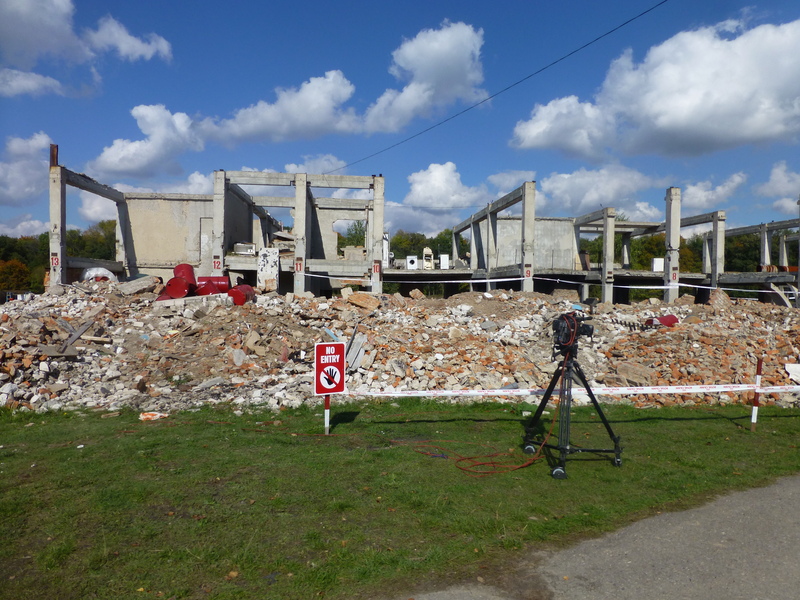 There were very impressive and tested everything from rubble searches to obedience. One of my favorite tests was the shotgun flinch. The dogs were instructed to heel and walk across the field with their master. During the walk, a shotgun was fired and if the dog flinched so much as an ear, points were deducted. Since the competition was international, everything was translated from Ukrainian into English. 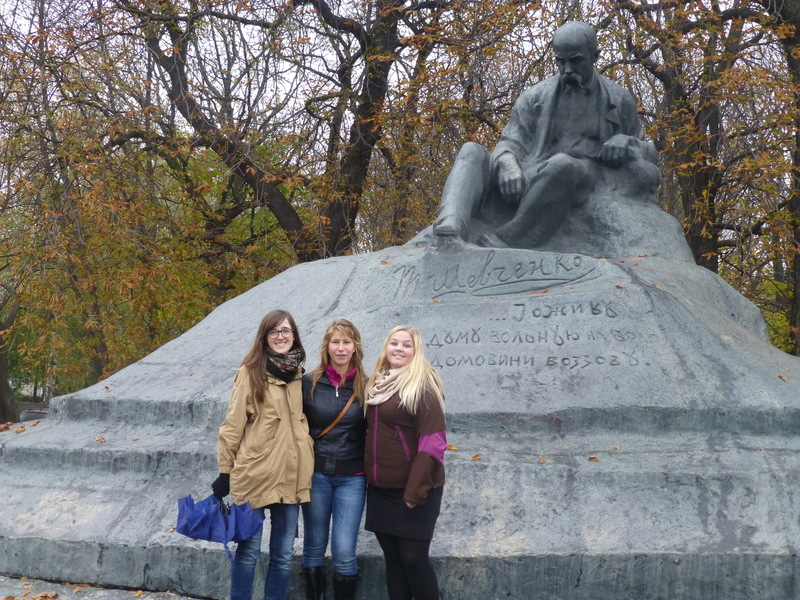 One of my friends from Sumy and one of my students from Romny both volunteered to be translators. It was great to see Ukraine represented on such an international level. Next year, the competition will be held in the Netherlands. Rubble search – can you see the computer, washing machine and bust on the 2nd floor? One of the favorite annual holidays at my school. Teachers are presented with more flowers than they can hold, chocolate and wishes of good health. Our children prepared a small concert for us. Later that night, our school rented out a local restaurent where we feasted, drank and danced until the wee hours of the morning. Apparently, one of the favorite national dishes of Norway is Kompe. It is essentially a potato dumpling made from grated potatoes, boiled, and filled with pork. My Norwegian friend in Sumy invited a bunch of people over for a Kompe-festival. We had a great time and even learned how to make Slovenian mulled wine. In turn, I had them over to Romny the next weekend for traditional Ukrainian food…pelmeni, cabbage salad and pickles! Pelmeni (ravioli style pasta) is traditionally made as a family and one piece is packed full of pepper instead of meat. The person who gets that piece must try to eat it without anybody noticing. 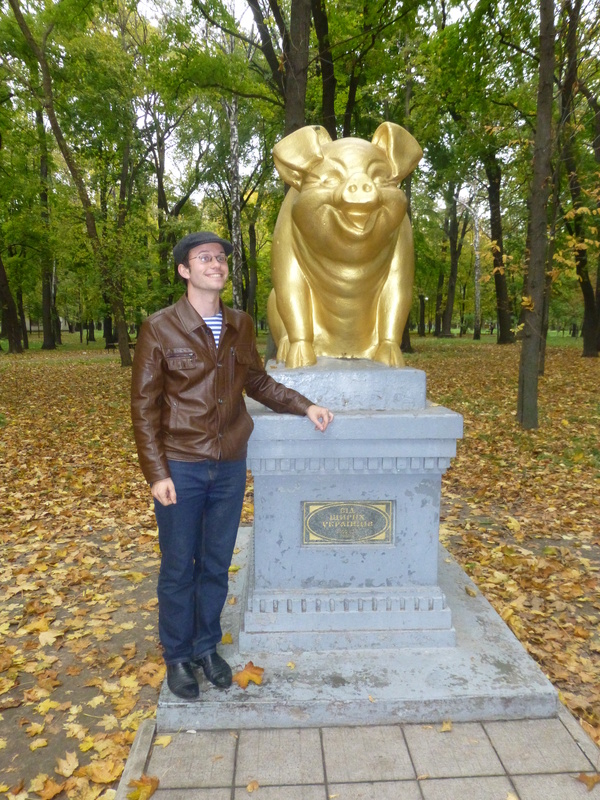 Can’t forget about the Pig monument and Garrett! 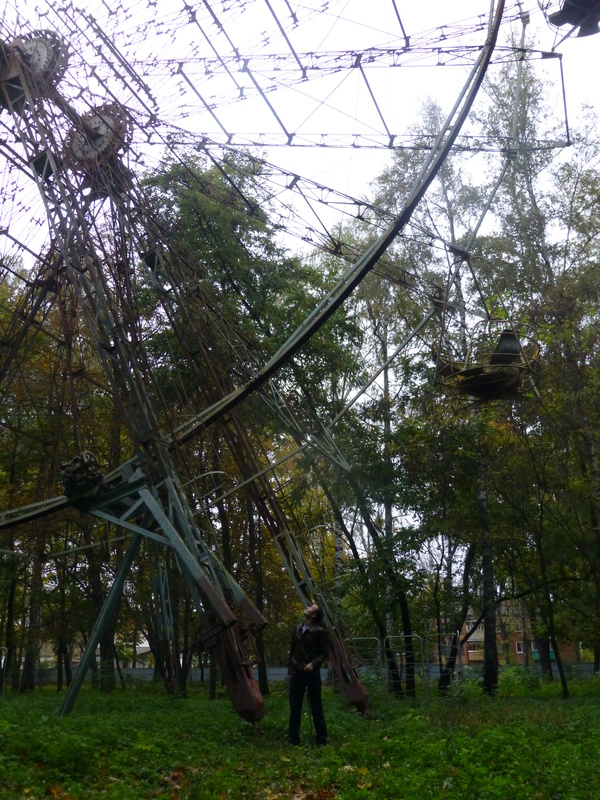 …or the abandoned ferris wheel! Every Ukrainian knows the Klitschko brothers, Heavyweight World Champions in Boxing. Well, now the older brother, Vitali, has decided to pursue politics within the Ukrainian Democratic Alliance for Reform party. He stopped in Romny along his political tour and made quite the splash. Hundreds of people gathered in our center square to see him yet mainly listened to his speech through the lens of their cameras. I understood about one in every hundred words he said, but his presence was still impressive. If life seemed hectic for the Oblast wide TEFL seminar, the announcement of a Nation wide seminar caught my teachers like deer in headlights. From what I could gather, there is a group of University Rectors from around the county who travel the country to see the project work of secondary schools. I am not sure why they do this or what they do as a result of their visit and I don’t think any of my colleagues did either. This seminar involved all 80 teachers of my school. There was a cultural presentation in our school museum, a technology presentation in our school computer lab and a talent show in our new auditorium. All three of these events were organized by teachers and presented by students. The talent show contributed the most stress. Over 300 students participated in some way. We displayed our academic talent, our sport talent, the talent of our teachers, our dance talent, our singing talent, our painting talent, our sewing talent, our arts and craft talent, and of course…our language talent. All in all, the show lasted about 2 hours and was considered a huge success. At first I thought the talent show was the grand finale of our seminar. I was wrong. After all the students had gone home, our guests and about 50 teachers came together to eat. Our school cafeteria had prepared all the traditional Ukrainian food, and our teachers had prepared an hour of entertainment for our guests during dinner. Everybody was dressed in traditional Ukrainian embroidery, the gymnasium was decorated with curtains, flowers and towels and of course, there was plenty to drink. Very good blog post. Please, don’t take that long again to keep your readers updated with your adventures.